My name is Mary Andrews. 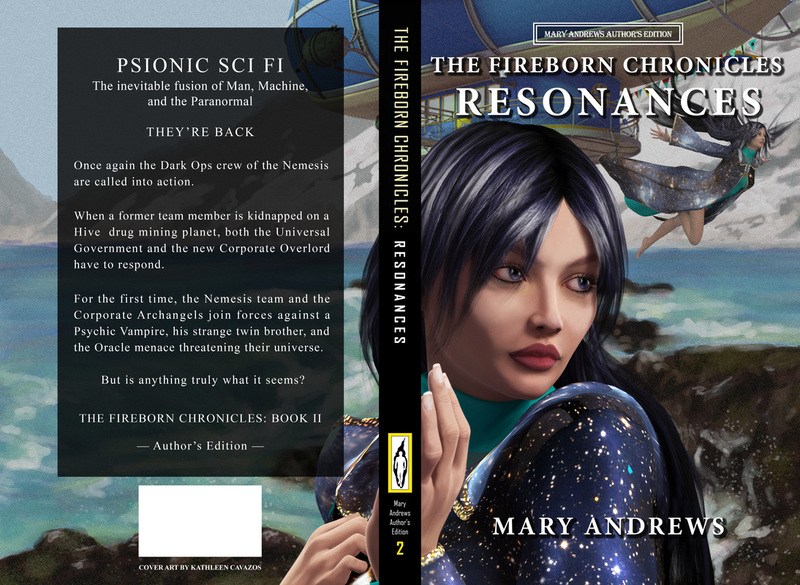 I write science fiction, Psionic Psi Fi. Welcome to my worlds. MACROCOSMS is my blog page is currently being reinstalled on this site. It will contain sporadic postings of Guest Bloggers My Macroscopic Memoirs, Author Interviews, Book Reviews, Writing Articles/links & more. 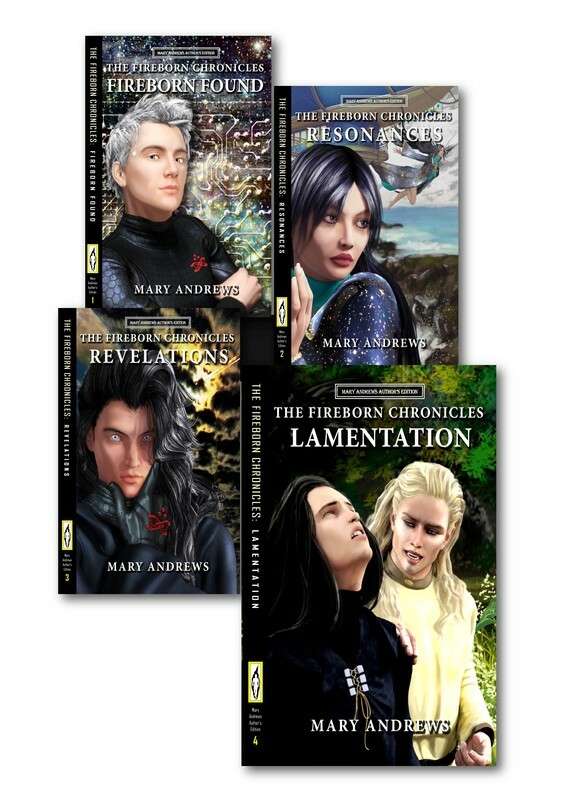 The BOOK PAGES each showcase an excerpt from The Fireborn Chronicles books, as well as reviews, buy sites, and updates. 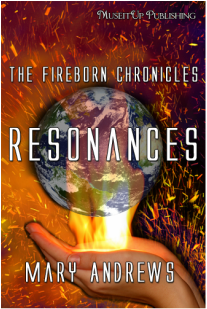 If you buy Trade Paperback of book 2, The Fireborn Chronicles: Resonances, from MuseItUp Publishing's bookstore you can receive the eBook free click here. It seems that my publisher wants to wait a year after publishing the eBook before releasing the print book. That's too long and too easy for it to get put off with scheduling and all. I love my publisher, but from now on, I plan to release Author's Editions of my printed books right off the bat.I put off doing this to the first book because I so love the original cover. Then, it disappeared off of the online sites and nobody could tell me why, so I went ahead and asked for the eBook rights back from Swimming Kangaroo Press and put out a re-edited version with a new cover and chapter illustrations. SK is no longer in business, but still keeps the books which they published available online. This page contains three humongous sets of live links for writers. For years I've been collecting information from so many talented and professional people that I can't even begin to list them. Thing is, I knew I wasn't ready for much of it, but that I would need it eventually. So I created three files and kept them on my desktop. Every time someone shared a nugget of wisdom, I cut, pasted, and categorized it. It is a long and ongoing collection and I like to share. The three categories are: LEARNING THE ART, GETTING PUBLISHED, and SELF PROMOTION. I try to check the sites every years so they should all be active. I'd appreciate a heads up if anyone finds expired links, though. Also, I've found that just Googling the headings can be very helpful. Enjoy. Contains info and documentation links about medieval Gypsies (Rom). The information originally was intended for use in the Society of Creative Anachronisms but the Roma, as they are currently known, are interesting in their own right, and the persona article is also applicable as a treatise on how to design as well as portray a character. 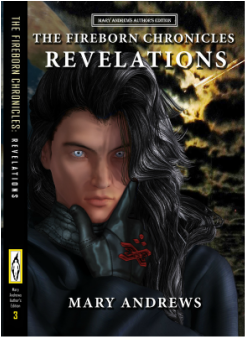 ALSO, the Roma of the future play a pivotal roll in The Fireborn Chronicles series--especially book 3, The Fireborn Chronicles: Revelations. The Write Right Critique Group is hosting local authors and their works on the pedestrian walkway (probably across from the theater). Join us to meet the authors write with the writers and buy their books. Gaming, Cosplay, Superheroes, Merchants galore...and me. Meet the Kraken, discover PSIONIC SCI FI (The inevitable fusion of Man, Machine, the Paranormal, and now...the Supernatural.) and rock on! Tell me about your novel. 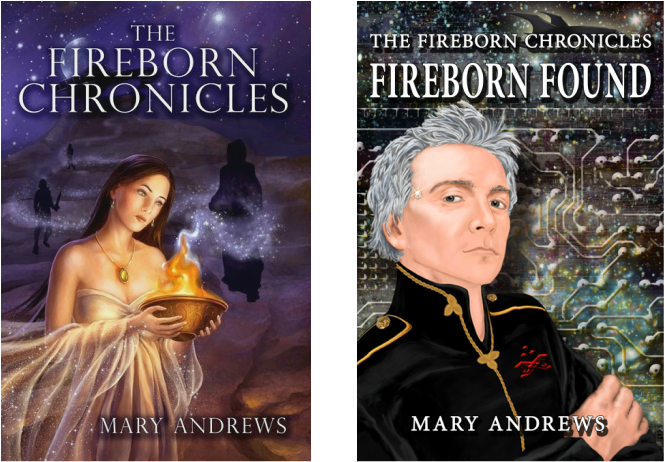 The first book of THE FIREBORN CHRONICLES has been released in both eBook and trade paperback. It is a science fiction story that takes place in a future where The Universal Government has offered a solution to most planets biggest problem: criminal and nonproductive members of society. Each planet remains free to determine for themselves what constitutes an unacceptable faction. Then The Universal Government will remove them, and employ them on the Hive Planet. Workers of the Hive are addicted to a wonderful and all-encompassing drug which can only be earned by working, thus converting each planet's formerly unproductive and dangerous elements into a universal workforce that provides the ultimate interplanetary temp service across a truly universal web. Since its creation, only one person has ever escaped the Hive Planet: A newborn, fully implanted with compu-link interface temple plates, but not yet introduced to the drug. He now leads a Dark Ops unit for The Gov on a mission to uncover a psionic ring of criminals who have inexplicably mind-jacked an important Government Ambassador. What they find will change the universe. This is book 1 of the series. 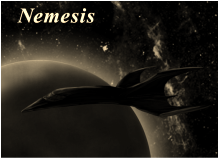 It contains three short stories which introduce the main characters as they are recruited to the Nemesis Team. Then in a novella-length mission, they meet another and their real adventure begins. All of my characters are at home in flame, hence the title. Cover & internal art by Kathleen Cavazos: http://rynjenji.deviantart.com/gallery/ Author's edition of book I includes some writing tweaks, author notes, and a new cover. Currently, this edition is the only available in eBook. THEY’RE BACK! Once again the Dark Ops crew of the Nemesis is called into action, but this time it's personal. When a former team member is kidnapped on a Hive drug mining planet, both the Universal Government and the new Corporate Overlord have to respond. So for the first time, the Nemesis team and the Corporate Archangels join forces against a psychic vampire, his strange twin brother, and the Oracle menace threatening their universe. Cover art by Delilah K. Stephans. Cover art by Kathleen Cavazos. Books are POD (print on demand) from Ingram. All major stores like Barnes & Nobel can order the book with ISBN number. The prophecy tells of their arrival. the Chosen One who binds them together, and the Dark Angel who will stand upon the mountain and save us all when the death from the sky is upon us." After Earth's destruction, humans have scattered and spread across the universe. The peace is kept by a universal government. Four rogue talents unite to become an invincible Government dark ops team--the Nemesis Team. But an unknown planet has turned up; a planet ruled by Oracles whose agents may be usurping The Government and suddenly, nothing is what it seems. Upon meeting the star-faring Roma and the inhabitants of the mysterious Oracle Planet, complications begin to pile up. Together the Fireborn are keepers of the peace, of the past, and of the future. Prophesy dictates they will save the Oracle Planet, but how are these reluctant heroes and their uneasy allies expected to save a planet with an asteroid bearing down on it? Also available from author at personal appearances. All major stores like Barnes & Noble can order the book with the ISBN number. night at Maxey Community Center. There are no fees. 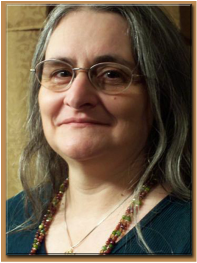 Our membership includes both novice writers and published authors of all genres. 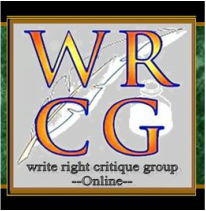 The WRCG-online Yahoo group is designed to allow writers and authors to network and share all things writing, It is open to all.. I'm not really one for blasting people with ads, but with all the research I've been doing, I couldn't help but wonder why the wondrous advancements in science haven't been better publicized. So I started posting them as I found them. Of course, many of the subjects I list actually may apply to the two books I'm writing now, but that's just gravy. Check out my "Book Page". and know that truth is stranger than fiction. For the past 5 years the Write Right Critique group has had a booth on the pedestrian walkway at the Lubbock Arts Festival. In it, we host a WRITE WITH THE WRITERS table for kids to sit down and write a story with us, and a MEET THE AUTHORS segment where our published members sell and autograph their books. This year's ARTS FESTIVAL is April 13-14, 2019 Drop by and check us out. Dark Ops Agent walk into a bar on New Earth. The loss of his lifemate has left Agent Ira Haze devastated, verging on insanity. But a psychic with a mind strong enough to save a world may be powerful enough to destroy it. Fearing for the safety of New Earth, the Corporate Archangel Gabriel, digs up an old acquaintance, Eric Barrows. Calling in an ancient debt, he tasks the vampire with saving Ira. Can Eric pull Ira from his spiral into madness? In the not-so-distant future, the source of Earth’s annihilation, is discovered in the far reaches of space. The massive asteroid bearing down on the planet is unstoppable and with little more than half a century left to save the human race, drastic measures are set in motion. An infallible set of Oracles—Roma triplets, mere teens— enact a world-wide plan. And, Eric Barrow, the last vampire on Earth, is coerced to build the first base on the Moon. I've finally started setting up my Bible project. I'm looking for artists or groups of students to help illustrate. It's meant to be used as a Bible study guide for parents and their children, teachers and their students, or just anyone who might like to sit and contemplate the word. The coloring pages are free to download for non-commercial purposes. I've set the project up at http://bible-project.deviantart.com/gallery/ because it is an artist community and might help me find more volunteers. Pages are free and downloadable there. Artists will be asked to respectfully render B&W illustrations from the unaltered text of the King James version of the Bible in any style of art. I did the first chapter of Genesis in doodle art style to make this point. I have plenty of chapters left and will try to accept all skill levels. This is a labor of love. Please check out the BIBLE-PROJECT deviant art site as well. Anyone interested can contact me though this site or email me at [email protected] . He has a drag and drop toy and food in the MORE box below. --You can feed him by dragging out the can of cat food and double clicking on it. --Pet him and he will purr and jump out of the basket to play with you if he's in it . --When you double click on the basket he will jump back into it.